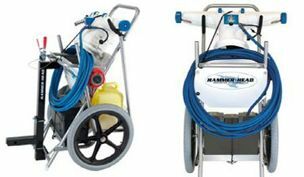 Are you a pool technician looking for an easier way to clean your route? Look here at the Hammer Head Service Cleaners. Instant cleaning with faster and easy cleaning time. These units are designed for the pool service technician or maintenance. Fast and easy to use to get the job done. Comes with everything you need. The unit is lightweight and the cart is fully balanced. Standard Service-21 unit includes: Cart, 21" head, 40' floating power cord, truck/trailer mount and two debris bags. Unit does not include battery, battery charger, pole, or chemical jugs. Due to ongoing improvements, products may be different from those pictured. What kind of battery will you need? We suggest the use of a 12 volt deep-cycle marine battery and a 10 amp automatic charger. Marine batteries typically come in series sizes 24, 27, and 31. We suggest a series 27 size battery. The bigger the battery, the longer the run-time. Avoid marine starting batteries, as they may have a shorter life span. A general purpose trolling motor battery will work fine. Sealed, or maintenance-free batteries are a good idea so you don't have to check liquid levels. Your charger should be able to handle 10 amps or better. Most automatic chargers have different settings fo 3 amp, 6 amp or 10-15 amps. For full overnight charging, you should use a 10 amp setting. Did you know that you can replace a motor and cord assembly by yourself with a few hand tools? If you have a motor problem, and you have a spare motor assembly, you can install a new motor assembly by only removing four screws in the vacuum head. You can send your broken motor to us and get back to work in minutes. See MOTOR PARTS AND ASSEMBLIES tab in the parts listing. NEW! The three-blade prop is now available! This exclusive prop design has smoother operation, more vertical clearance, and better weedless capability.